NPM-T PDUs represent state of the art between power supplies and remote monitoring. * Committed power and instant power. * The presence of smoke and liquids. Special PDU that in a single 2 U top drawer collects 2 NPM PDUs with hot-swappable intelligent module. Each of the two PDUs supplies three UA mounting units PDUs installed on the rack sides between the uprights and the side panels. The side PDUs are available in various versions, from 12 C13 to 8 Schuko sockets, to 6 C19 sockets. There are also two additional outputs for each PDU: a Schuko and an industrial outlet with 3 m long cable. This PDU offers immediate redundancy without having to install two vertical mount PDUs. 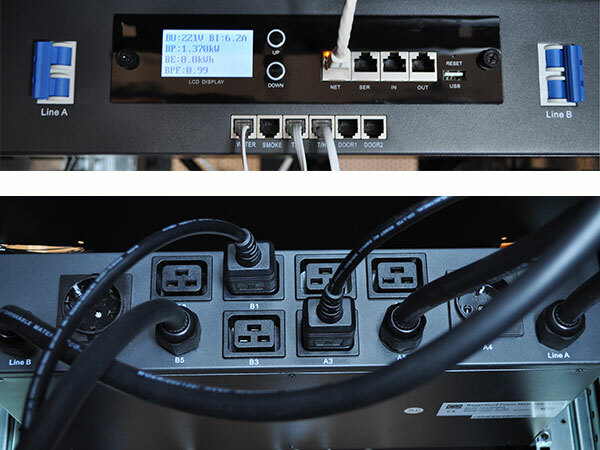 A single display on the front of the PDU allows you to view the electrical and environmental parameters inside the rack. The SW installed in the PDU allows remote monitoring. The NPM-T PDUs are equipped with a dedicated FW that allows access to the PDU remotely using the most common browsers (IE, FIREFOX, etc.). The most commonly used communication protocols are HTTP, HTTPS, SYSLOG, SERIAL PORT, RADIUS, NTP, FTP, SNMP, SMTP, IPV4. The product can be set to handle different levels of access. The user can manage, as administrator or as a simple user, one or more cabinets depending on the assigned rights. This guarantees safety even in case of co-location cabinets.